The PC market moved into its sixth straight quarter of declining sales, analysts reported on Wednesday, although the dip was less pronounced than one firm expected. Market research firm Gartner reported that third-quarter PC sales dipped by 8.6 percent to 80.3 million units for the July-to-September quarter. IDC, with its own report, said the drop was 7.6 percent to 81.6 million units; the firm had previously projected a worldwide decline of 9.5 percent. Normally, the third quarter marks the beginning of the upswing for the PC market, as students and educators invest in new hardware during the so-called back-to-school buying season. But sales apparently failed to materialize, either an indication that students are turning more to tablets or simply were using notebooks that they had bought previously. On the other hand, emerging product categories and a greater assortment of Windows 8-based models pushed sales volumes slightly higher, IDC reported, as did the migration from Windows XP to Windows 7. Rajani Singh, an analyst with IDC, noted that the U.S. market was essentially flat at 0 percent growth, helped by Chromebooks and what the company called “ultraslim” devices. 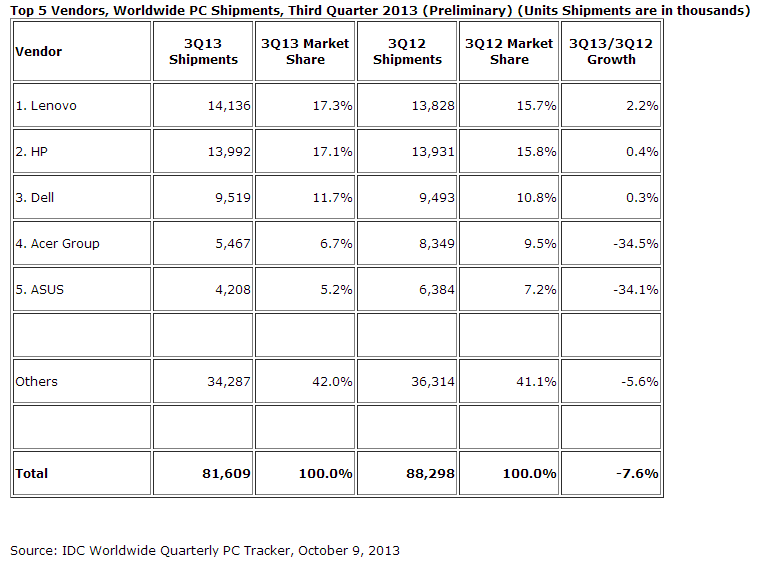 According to IDC, Lenovo led the pack of PC vendors for global sales during the third quarter. Both Gartner and IDC said that Lenovo had again edged out rival Hewlett-Packard for a second straight quarter, with Lenovo showing a 2.8 percent increase in unit sales to 14.1 million units. HP and Dell also demonstrated 1.5 percent and 1.0 growth, respectively. But Acer’s sales plunged 22.6 percent, followed closely by Asus, with a 22.5 percent decline in shipments. However, both Acer and Asus have shifted their focus towards the tablet market, Gartner said. 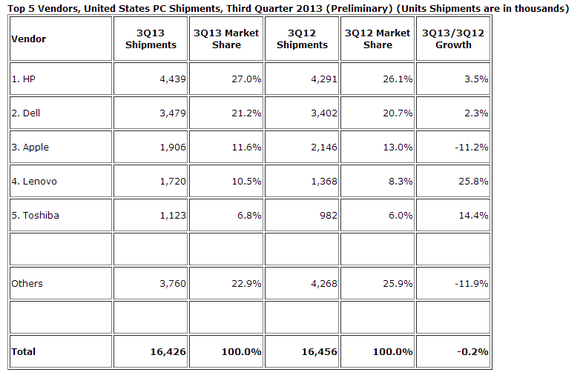 Lenovo’s market share is 17.6 percent, followed closely by HP, at 17.1 percent, Gartner found. 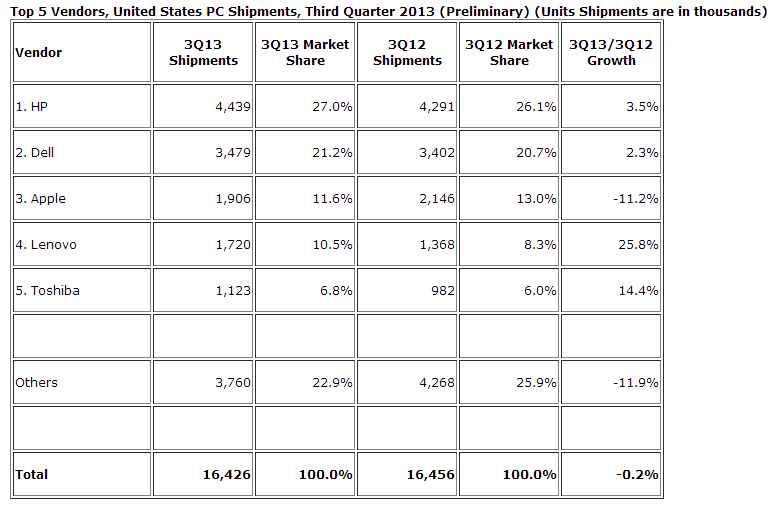 Dell, Acer, and Asus make up 11.6 percent, 8.3 percent, and 6.1 percent, respectively. 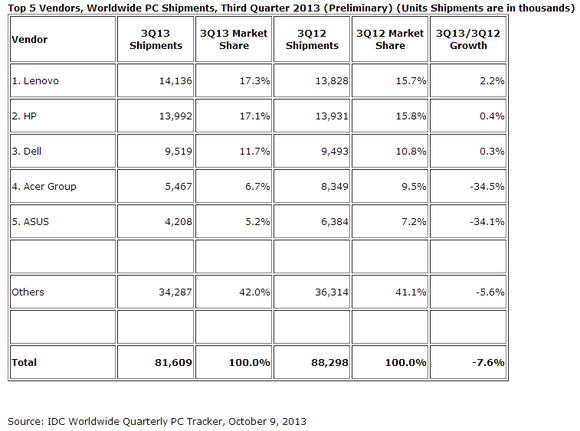 HP was the top PC vendor in the U.S. during the third quarter. According to Gartner, HP was the top U.S. PC vendor, with a 26.9 percent market share. Dell (21.0 percent) and Apple (13.4 percent) followed, then Lenovo (10.5 percent) and Toshiba (7.0 percent). Apple was the only vendor among the top five to record a drop in shipments, down 2.3 percent. IDC largely agreed with Gartner’s numbers (as shown in the above chart), although the firm said that Acer and Asus recorded a steeper drop in shipments. Both IDC and Gartner typically release tablet sales as part of a separate report, which will provide more insight into how the overall market will fare. So far, the promise of Windows 8.1 has failed to ignite the PC market, as has the new “Haswell”-based notebooks from Intel’s PC partners. Will the fourth quarter show some signs of life, as Microsoft has predicted? So far, the best news is that it looks less gloomy than predicted. And that isn’t saying much.